Turner's photograph of the Airebank Mill fire at Gargrave carries the wrong date. The fire was actually on 14 November 1912. You are correct Dennis, it was in the Craven Herald for 15th November 1912, stating that it happened "last evening" so it must have been the 14th November, and not October, as written on the photograph. Thanks. Admin. BIG BLAZE AT GARGRAVE : Airebank Mills Gutted, 300 people affected. One of the most fierce and disastrous conflagrations ever recorded in the history of Craven was that which occurred last evening at Airebank Mills, Gargrave, where Messrs Whittle, Brindle & Co carried on business as spinners and doublers. At 4 o’clock the premises were a hive of industry; at 8 a blackened ruin. Only the four walls were left standing, and within them was a mass of fallen masonry and tangled machinery. Gargrave has been singularly unlucky in occurrences of this character, this being the third occasion upon which mill premises on the bank of the Aire have been devastated by fire. The last occasion was in November 1874, when the buildings were gutted, while on the 17th November in 1865, during the occupation of Messrs Bracewell Bros, the mill was destroyed and damage was done to the extent of £20,000. What this most recent outbreak means to the village of Gargrave it is difficult to contemplate. In an industrial sense this beauty spot has been one of the most unfortunate of Craven villages, and just when there appeared every prospect of a run of prosperity – for Messrs Whittle & Brindle were working full time, with every indication of doing so for some months – there comes a catastrophe which will bring hardship to many homes during the prevailing winter. About three hundred persons will be deprived of their employment. Some may find it in the vicinity; others will be compelled to seek it elsewhere. What then is to become of the village? How the fire originated The main building at Airebank Mills – and this was the one principally affected – was three storeys in height with a garrett, twenty-six windows in length and, ten windows in width. It stood, perhaps, 500 yards from the main road from Skipton to Gargrave – almost midway between that highway and the Midland Railway. The boiler-house and offices were detached from the main building, but other premises on the west side were attached to the Mill proper by a wooden gangway. The outbreak was discovered at 4.30. It appears to have originated in what is known as the rope race in number one spinning room, which was situated near the engine-house and on the first floor. Persons working in the room at the time state that the rope race suddenly ignited; there was no smoke. In an incredibly short space of time the flames had spread to a mule, then they attacked the ceiling and worked their way round the roof. The occupants of the room immediately took what measures they could to prevent the fire spreading; the sprinklers did their work admirably and the brigade attached to the mill were quickly summoned and worked with commendable determination. It was evident that their task was one of considerable magnitude. The alarm was promptly given to the workpeople on the floor above and others in the building became aware that something of an extraordinary nature had occurred by the sudden stopping of the engine. Fortunately there was no panic. The employees made their way to the fire escapes and descended them in perfect order, not a single mishap occurring beyond a few cases of fainting among women after they had reached a position of security. For a quarter of an hour or twenty minutes the members of the mill brigade, who by this time had been reinforced by a host of willing helpers from the village, fought the flames to the best of their ability, but it was evident from the commencement that they were playing a losing game. At nine minutes to five the alarm was sent to the Keighley Fire Brigade - which is retained by the Skipton Rural District Council for outbreaks within their area. A WEIRD SCENE It would be shortly after 5.30 when the up-to-date motor pump and ten men from the Keighley Brigade arrived at Gargrave. It is said that they accomplished the distance in a little over 30 minutes. By this time the flames had got firmly hold. The ceiling of the first floor was demolished and the flames rapidly made their way to the roof of the upper storey, which was soon one mass of fire, casting into the sky a lurid light, which could be seen for many miles around. The scene was one of awesome grandeur, not without a touch of weirdness, accentuated by the hoarse cry of the buzzer, which was not stopped from the time it was set going to give the alarm until the steam in the boilers was exhausted and the flames had subsided into a dull red glow. When the fire brigade arrived they got to work with praise-worthy smartness, but it was impossible for Chief Officer Marlton and his capable staff to do more than prevent the flames reaching the buildings detached from the mill itself. This they succeeded in doing, although at considerable personal risk – a risk shared also by some of the employees of the firm. The wooden gangway connecting the building on the east side of the mill was hacked away by the firemen and other assistants, who were for a considerable period in a position of imminent danger, in as much as the gable end was bulging ominously above them, and the flames were raging furiously in the first and second storeys. Only a few minutes prior to this the two top storeys of the west gable had fallen with a tremendous crash into the field beneath, many tons of masonry being scattered in all directions. Fortunately the firemen had vacated their position in close proximity to this wall a short time previously. Otherwise fatality would have cast an added gloom over an already stricken community. THE VILLAGE IN DARKNESS The flames spread with amazing rapidity. The first and second floors crashed into the lower storey and by eight o’clock the whole of the bottom portion of the building was blazing like a furnace. The surrounding fields were crowded by sightseers. Some were there out of idle curiosity, but doubtless there were among them many of the workpeople whom the conflagration will deprive of their means of livelihood. By nine o’clock the flames had become more subdued, and before midnight there was nothing left but smouldering wreckage. 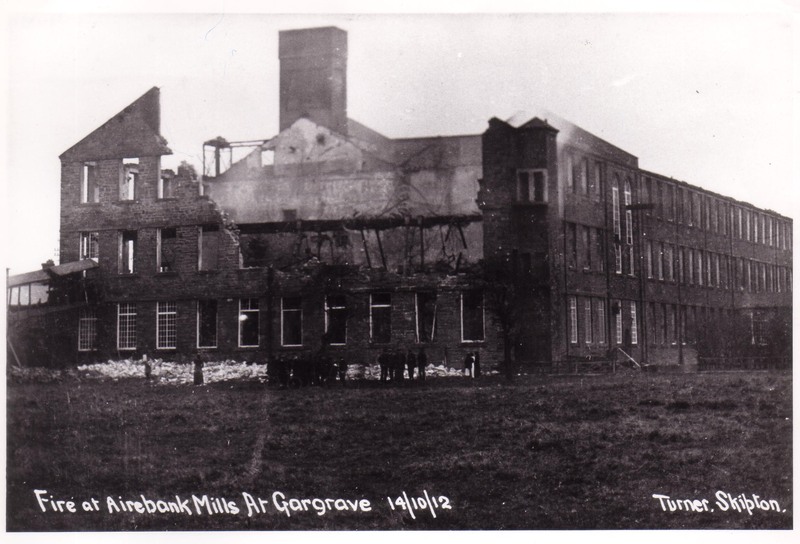 Perhaps one of the most alarming features in connection with the outbreak was the fact that within a few yards of the main building there is situated the Gargrave Gas Supply, which is made at Airebank Mills. As soon as the serious character of the outbreak was realised, prompt measures were taken to let off the gas and a population of almost 2,000 had to rely upon candles and lamps for their illuminating power. The fabric was the property of Sir Mathew Amcotts Wilson and was insured. The position of Messrs Whittle and Brindle in this connection was not ascertainable last evening but it was known that their stock of cotton was an exceptionally large one, and that the damage must be enormous. The Skipton Fire Brigade, we understand, was in readiness awaiting a call, but none was received. My Grandfather was born in Gargrave on 15th Nov 1912. In his memoirs he states that the night he was born" Low Mill was burning fiercely", is this Airebank Mills ?? ?